Don Orsillo and Jerry Remy were on fire last night, uttering one-liners as easily as Adrian Gonzalez knocks in opposite-field hits. 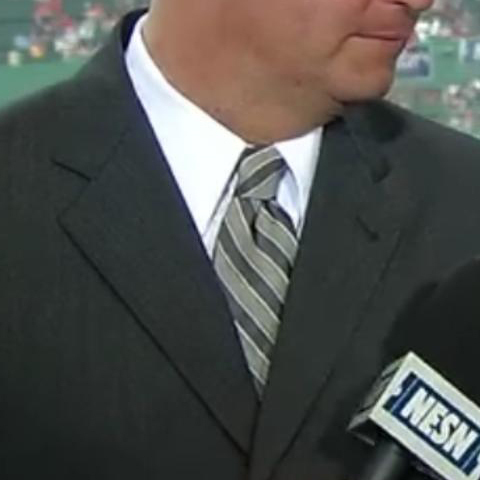 As NESN cameramen showed Charlie Moore the pair returned to Orsillo’s paddle boat adventure. Fish tales were exchanged, such as Adrian Gonzalez batting .453 with a .540 on-base percentage and .906 slugging in June thus far. Actually, that’s true. In the bottom of the seventh Craig Counsell matadored Darnell McDonald’s grounder, an error that allowed Drew Sutton to score. “Looked like Roberto Luongo at shortstop on that play,” quipped Remy. Incidentally, Sutton has seven doubles in 34 at bats. Three players with more at bats have fewer doubles than him: J.D. Drew, Marco Scutaro, and Jason Varitek. The latter two have their reasons, but Drew, not so much. The NESN broadcasting pair delighted in Terry Francona’s obliviousness to basic hockey concepts. “Boy, he has no clue. None,” stated Remy. Line shifts, power plays, and offsides are as obscure to Francona as hitting offspeed pitches are to Wily Mo Pena. Nonetheless, Francona donned a Marc Savard jersey for his pre-game press conference, which was part of the Bruins treasure trove that Josh Beckett bought for his squad. All their ribbing in light of Claude Julien’s statement of appreciation to the other Boston coaches prior to the Bruins’ Rolling Rally made me wonder what Francona, Bill Belichick, and Doc Rivers possibly discussed with the Bruins’ manager. On Brad Marchand: You gotta keep those little squirts in their place. Call him “Marshmont.” All. The. Time. Dropkick Murphys: They’re gonna ask for free tickets forever. “Sweet Caroline:” You are just so lucky that didn’t take over. Make it stop at “Dirty Water” and “Tessie.” Believe me. On hockey strategy: What are those blue lines again? Bruins Hockey Rules commercials: Wait, those aren’t actual hockey rules? Zdeno Chara: Is he available to play center? Rene Rancourt: We gotta get a regular like him. This Gino thing is getting old. Dropkick Murphys: Still waiting for our song. Celtics Dancers: I know our teams are all about tradition, but damn. The Garden: We’ll need an annex for the banners soon. Finger-biting taunts: Don’t sink to their level. Tim Thomas: Too talkative in press conferences. Dropkick Murphys: Same here. I’ve heard AC/DC and U2 a bit too much. Their respective leagues: [Here Belichick paused as if he were going to say something.] Next question.